This past September was the 49th Annual General Meeting and Scientific Conference of the Australian Entomological Society (AES). The Society publishes an Australia-focused journal and maintains, through its membership, a network of professional and student entomologists. Every year the network comes together for the AES conference. Conferences are an important part of scientific life. Hundreds (maybe thousands) of entomologists/physiologists/oncologists/physicists/etc. descend onto a hapless hotel or convention centre for 2-4 days and give talks, attend dinners and workshops, and (sometimes) have debates. And it pays to attend and present your work. A scientific paper can sometimes be in press for months on end, and a project might involve years of data collection. By presenting, you’ll make sure that everybody knows who you are, what you do, and (maybe most importantly) what you look like. We most often trade in names and citations, so a face to a name can be a helpful personal link to a professional connection. At national conferences the delegation is usually well acquainted. The AES conference attracts a ‘modest’ 100-200 delegates most years. There are regulars, occasional overseas visitors, and a good mix of students and postdoctoral delegates from the country’s various research institutions. This year, PEARG sent six students and one postdoctoral researcher. Rather than organising flights for seven, we rented a van and made our way to AES over two days. This would be unremarkable were it not for the fact that this year’s conference was held in the red center of the country; Alice Springs. 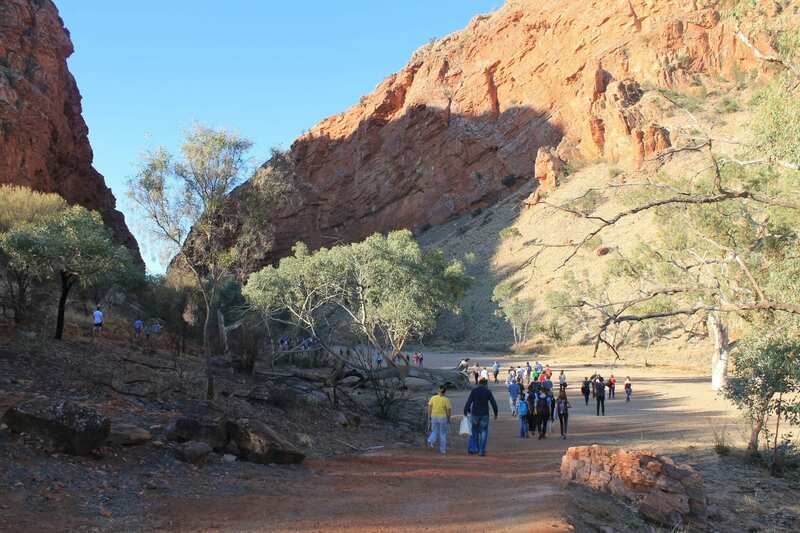 From Melbourne, Alice Springs is a 2,250 km trip spanning three states and one territory. We rented an eight-seater van, planned all our accommodation well in advance, and made some 60 sandwiches, two breakfasts, two lunches, and one dinner. We set off at 5am on a Saturday morning, congregating in the cold and loading up seven people’s worth of gear. For a trip through the red center, we also took safety precautions: a first-aid kit, satellite phone, and more water than we’d expect to need. We took turns driving in roughly two hour shifts to avoid fatigue. After a brief miscalculation, barely making it to a service station to fuel up, we skirted around Adelaide and up past St. Vincent’s gulf, making our final stop before heading inland at Port Augusta. This was, mind you, already 12 hours into the drive. About an hour out of Port Augusta, we finally entered the desert: the vegetation got lower and the landscape flattened out into an extreme vista, which made a particular impression on us as the sun set. Among us, we had little prior experience with the central Australian landscape. 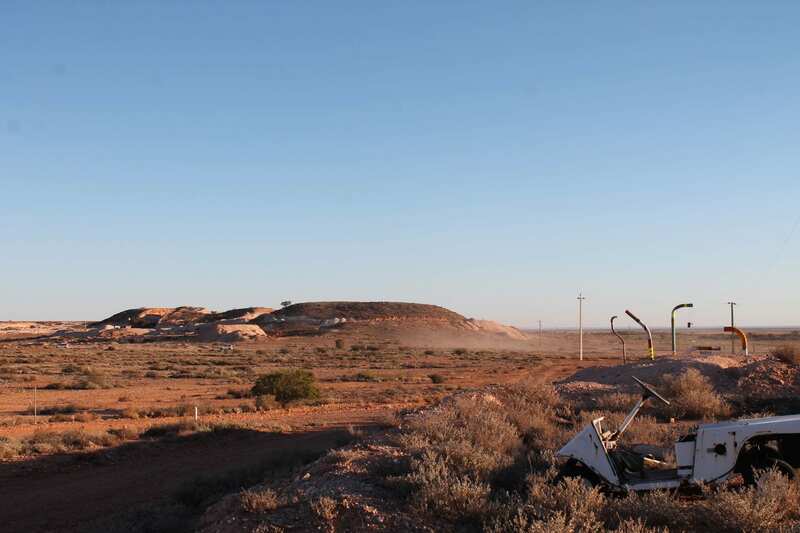 After roughly 18 hours driving, 5am – 10.30pm, we made our first (and only) stop on the way to Alice: Coober Pedy. 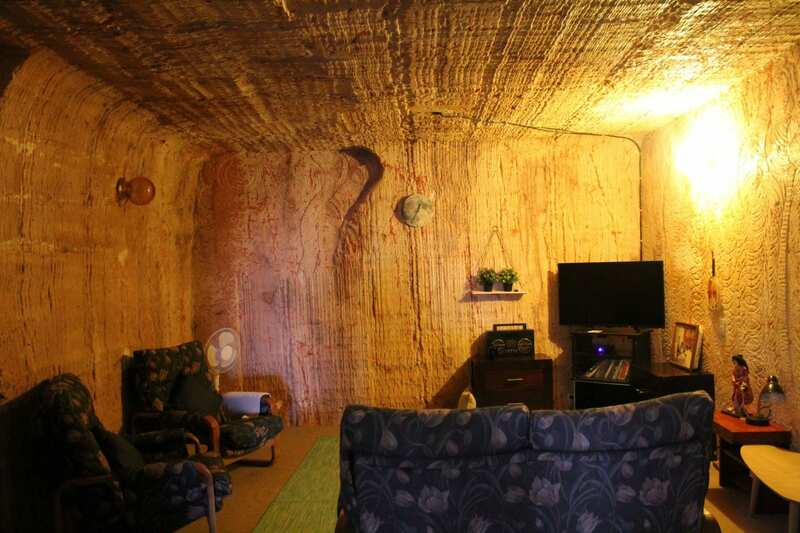 The summer temperatures in Coober make “dugouts” a popular accommodation option, for locals and travelers. This is basically a cave, bored into the side of a hill. We were lucky enough to have a contact in Coober and had the opportunity to spend our night in an exceptionally well-furnished dugout. That night was also Jacinta’s birthday, and Marianne was industrious enough to have prepared a cake the night before. A birthday is probably not best spent mostly inside a car, but cake before bed in a cave in the desert isn’t a bad way to end one. Our next morning started at a reasonable hour. 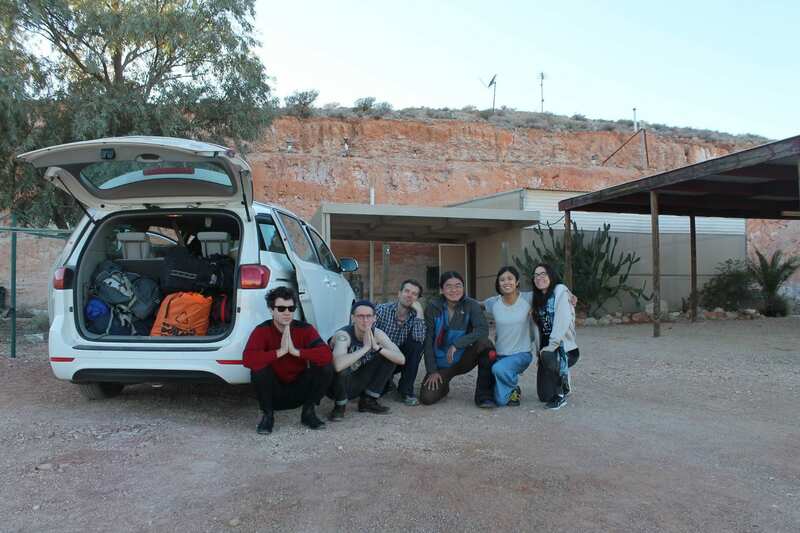 We departed Coober Pedy at 7am, ready for arrival in Alice and then conference registration! Although, we were glad to take a few minutes in the morning to have a proper look at the landscape before we set off. The view outside of our troglodyte home for the night, complete with other dugouts in the distance. We reached Alice shortly after 2pm and checked into two separate AirBnBs to accommodate us all. The first part of any conference is registration, where you’re given a lanyard with your name, a program, and usually a tote bag, but AES truly begins the night before the conference proper for the welcome function. 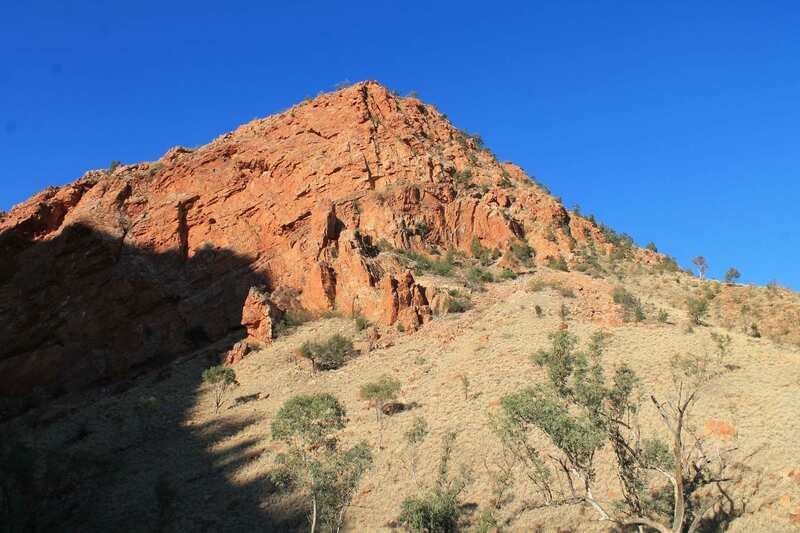 This year we had it at Simpson’s Gap, complete with a rock wallaby sighting. A day before we’d arrived, Alice had had its first big rain for months, so the waterhole was full too. Sunset might be the best time of the day to truly appreciate the colors and contrasts of the Australian landscape. 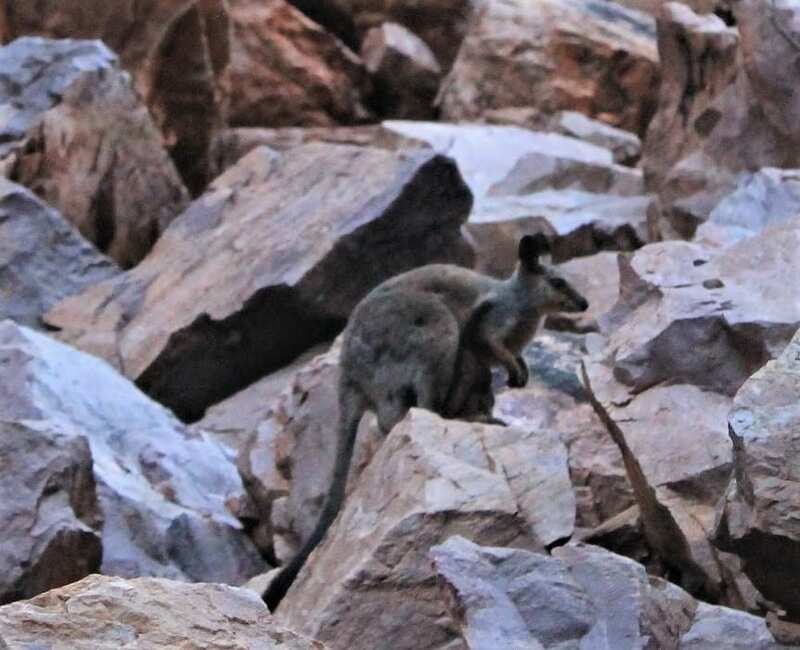 A blurry and unexpected guest to the welcome dinner: a black-footed rock wallaby, a near-threatened species native to the Central Australia arid zone. The welcome function was a good opportunity to go through the meeting and greeting ahead of official proceedings. Among the delegates to meet and greet was former PEARG researcher, now postdoctoral entomologist at AgriBio, Isabel Valenzuela. From left to right; Marianne, Sam, Xuan, Josh, Isabel, Tom and Ollie. The conference opened on the following morning with, predictably, an opening address. Two, in fact. The first was from Fiona Walsh, an ethno-ecologist, and Veronica Dobson, an Eastern Arrernte author, both locals. 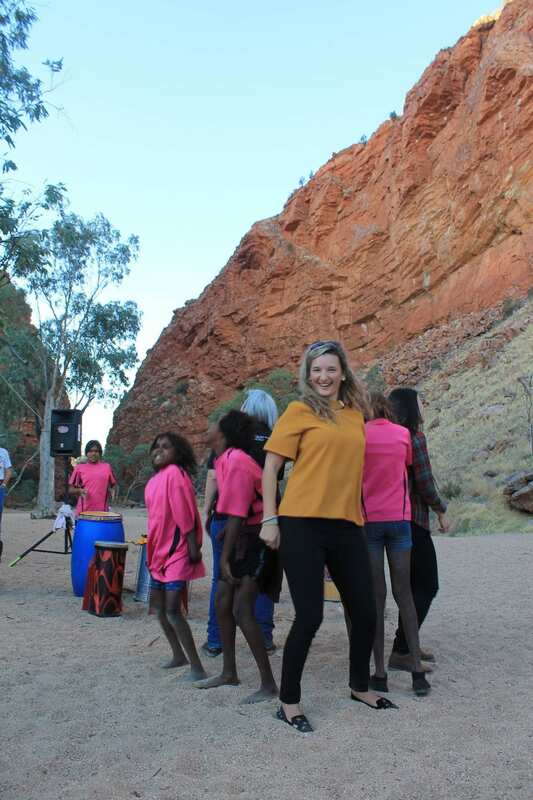 Veronica and Fiona have worked together on a number of publications about the incorporation of indigenous knowledge into land management in Australia. In particular, local hawkmoth caterpillars (Lepidoptera: Sphingidae) play a big part in the Eastern Arrernte dreaming; the system of stories and songs that codify indigenous Australian law, knowledge, and social practice. Scientifically, very little is known about the caterpillars, but indigenous knowledge (in no small way made more accessible by Veronica’s work) provides a framework for their study and management. 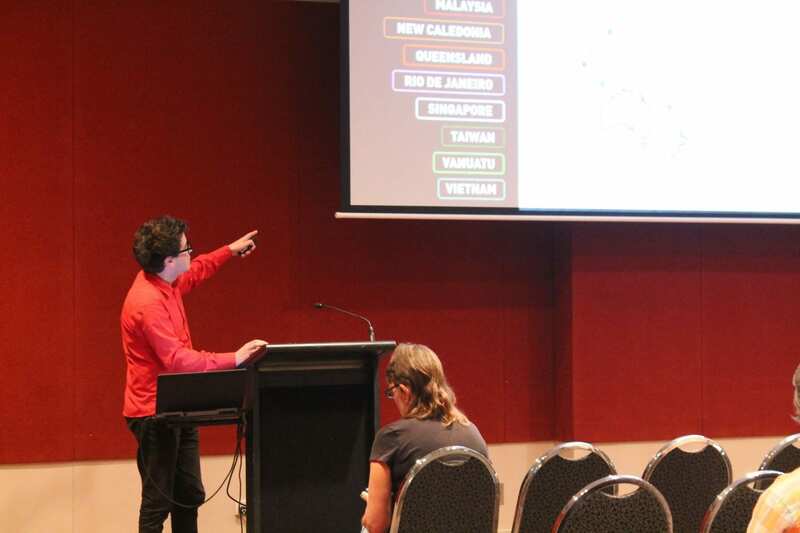 The second was more conventional; Theo Evans from the University of Western Australia spoke about the evolution of termites and about how and when they acquired their ability to engineer ecosystems and shape landscapes. Jacinta Kong presented her PhD research on the evolution of grasshopper life cycles. Jacinta, along with her supervisor Michael Kearney (who also attended and presented a keynote address), use models of insect physiology to predict their responses to climate change. Tom Schmidt, now a postdoctoral fellow, presented some recent results tracking the invasion pathways of Aedes aegypti, and invasive mosquito known to vector Dengue fever, into Australia. 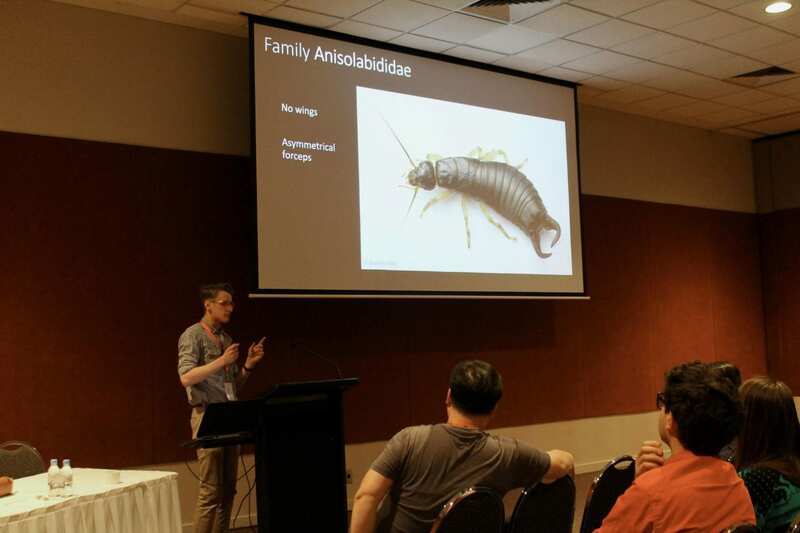 Josh Douglas, now close to submitting his PhD thesis, works on predicting the behaviour of millipedes and terrestrial isopods (aka slaters/roly-polies/pill bugs) in crops and pastures. Neither millipedes nor isopods are insects, technically speaking, but we forgive Josh. Samantha Ward is a PhD student from the UK and hymenopteran taxonomist, which means she studies the classification and identification of wasps. 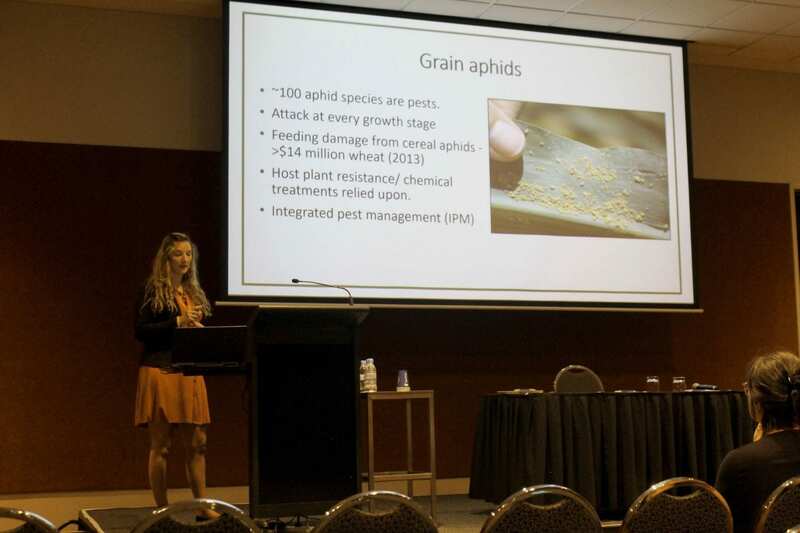 Sam reported on the ongoing status of her PhD project enumerating the diversity of wasps in Australia that parasitize aphids, a group of major pests. Oliver Stuart recently submitted his masters thesis on earwigs. Earwigs are known for all looking very similar, and Oliver’s work provides a framework for properly cataloguing the biodiversity of earwigs in the grain landscapes of southern Australia. Marianne Coquilleau, now well into her Master of Philosophy, also studies wasps, but instead is focusing on wasp parasites of agromyzid flies, or leaf miners. The vegetable leafminer is another emerging pest of agriculture in Australia. By studying their parasites ahead of time, we can get the jump on them before they arrive. Xuan Cheng recently submitted his PhD thesis on the redlegged earth mite, a major crop and pasture pest in Australia. Having finished recently, this was a particularly important presentation for Xuan. The forefather of mite control in Australia, James Ridsdill-Smith, was present for Xuan’s presentation, and fortunately Xuan survived the resultant Q&A session. Some conferences (particular scientists, in some cases) are known for producing particularly scrutinising questions. Having others dissect your research methods and conclusions is, of course, a major part of publishing and research, but it is slightly more gut-wrenching in person. The AES conference has a more relaxed and favourable atmosphere. Top to bottom; Sam, Ollie & Tom presenting their research. The remainder of the formal conference proceedings was spent attending other presentations and keynotes, reading up on the posters, and networking in-between at the various lunches and morning teas. Networking really is the name of the game at conferences. It’s not uncommon for a scientist to scan the conference schedule ahead of time for interesting keynotes and symposia, there may be someone they’re particularly keen to have a chat to. 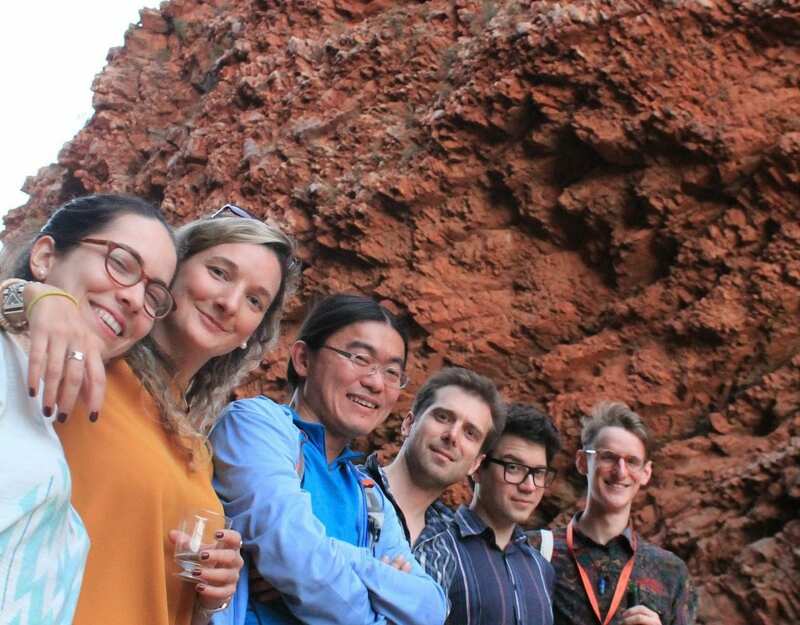 The AES conference also has an active student representative body, headed by Melissa van der Wetering, who organise student networking events. This year’s entertainment, as usual, surpassed expectations. After bribing non-students Tom and Isabella to act as our ‘mentors’ to assist during the trivia, we settled in to listen to a fascinating talk by Erinn Fagan-Jeffries, a PhD student at the University of Adelaide. Erinn had had prior training as a science communicator and captivated us all with her hijinks and accidental soaking of a staff member by precariously balancing a jug of water on his head! Subsequently the evening of trivia was complemented by – a student’s favourite – free food! Sam, Marianne and Ollie were members of the winning team, and were showered with gifts, courtesy of generous companies. It was wonderful until we had to use our Tetris skills to pack the van on the return journey with trugs and butterfly nets. 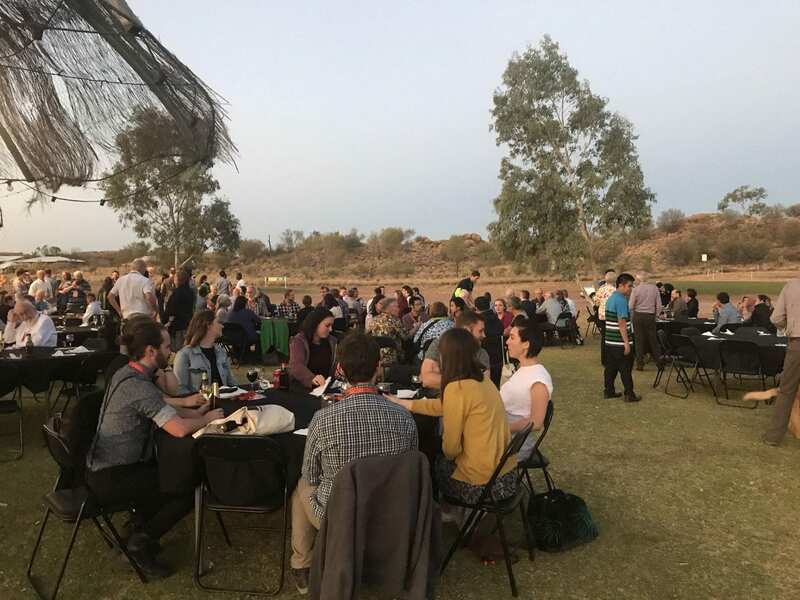 On the penultimate day of the conference we all scrubbed up for the ‘dinner under the stars’, that took place in the grounds of the Alice Springs golf course: a beautiful, manicured area in the middle of the desert. The evening included alcohol-fueled chit chat with our peers, a delicious buffet, and lots of laughter. The highlight of the dinner for most was the guest lecturer who educated us on the constellations and their stories and significance in Arrernte culture. We spontaneously opted to extend our trip for an extra day. How often are we 2000+ km from home?! 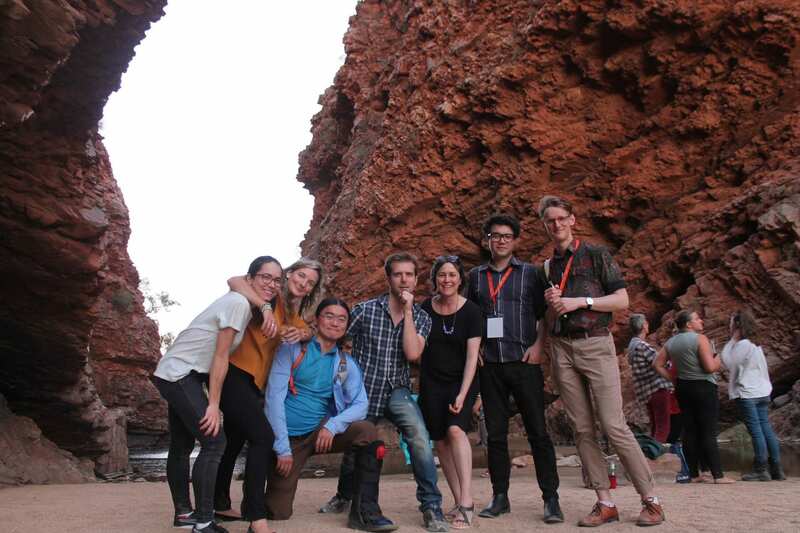 After the conference ended and we waved goodbye to our fellow entomologists who were returning to their respective ends of the country, we drove out to the picturesque West MacDonnell ranges. 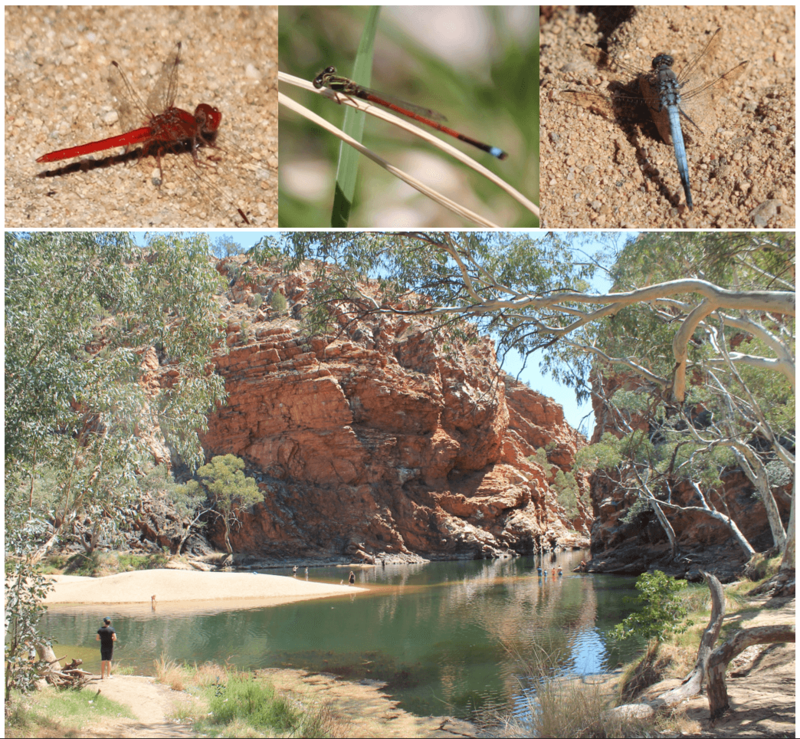 There, we were enthralled by Ormiston’s gorge and, in true entomologist style, set about looking for as many weird and wacky insects we could find! Yet again we packed the car with 60 sandwiches, ourselves, and our bulging suitcases, now filled with conference goodies. The return journey was long, hot, and rather more tiring after the frivolities of a multiple-day conference! 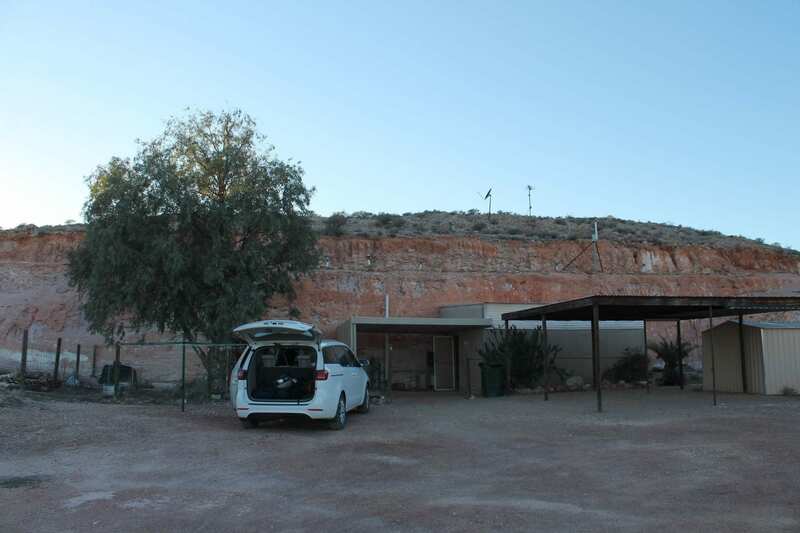 The trip was broken up with another stay at the cave in Coober Pedy before the final leg back to Melbourne. The bright lights of the big city appeared after a 15+ hour day on the road. Returning full of new knowledge, motivation, lists of contacts, interesting new leads, and stories to tell, we had done what we set out to achieve. But no time to reflect…our first port of call was bed to recuperate to head straight back into the lab… No rest for the wicked in the world of entomology! Next Next post: Hot enough?